Born in Trinidad, Billy settled in London’s East End when just seven years old. The calypso crazy kid soon got turned on to soul singers like Otis Redding and Sam Cooke, as well as pop groups like The Beatles and The Rolling Stones, leading him to spend much of his study time in the music room. Billy got his first break when he signed to GTO records, for whom his second single was the Motown-ish Love Really Hurts Without You, which reached No. 2 in the UK charts and No. 12 in the US. Two top twenty singles followed; Love on Delivery and Stop Me, then Red Light Spells Danger became a smash in both the UK and the US. 1986 wasn’t bad either, opening with When the Going gets Tough (the tough gets going), the theme song to the Michael Douglas/Kathleen Turner/Danny Devito movie Jewel of the Nile. Billy then launched the Love Zone album, which went straight to No. 2 in the UK charts, staying in the top 40 for six months. In the US, there was a No. 1 single with There’ll be Sad Songs (To Make You Cry). More Hits were to follow with the now classic Get Outta My Dreams; Get Into My Car, giving Billy yet another US No. 1 hit. After huge worldwide success and with a young family at home, Billy decided to take a break to spend some well earned time with them. In 2007, with the kids all grown up, Billy went back out to perform his hits again, this time with his daughter Cherie on backing vocals, with live dates in the UK and Europe, USA, Canada, and the Caribbean. The tour was a great success and culminated in his getting the bug once more for writing and recording. 2008 saw Billy back in the studio for the first time in 15 years, recording his brand new album ‘Because I Love You’ – which was released in 2009. 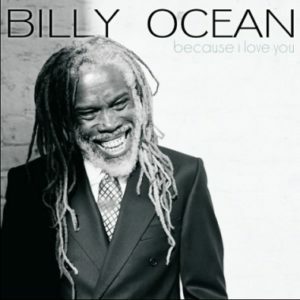 2010 saw Billy back on the road again with his band in the UK, Europe and the US and the release of ‘The Very Best of Billy Ocean’, which entered the UK album charts at number 17 and sold 72,000 copies in 4 weeks. Billy recently headed over to America where he played to fantastic crowds in Las Vegas, Detroit and Pennsylvania, Virginia and Florida. In 2016 Billy announced double CD ‘Here You Are: The Best Of Billy Ocean’, featuring new tracks and along with a selection of his greatest hits, to be released 29th April 2016.